There’s nothing left for Christmas! At least that seems when we walk through any city and see all the shop windows adorned, the lights in the streets … Have you already prepared the decoration of your house? We already saw in previous articles how you could decorate the dining room or even the bathroom, and today I want to show you several ideas so you can decorate another room of the house that we sometimes leave a little forgotten in this type of questions: the kitchen. Christmas can also come to this place, a place that may become a meeting point for your family gatherings. It is nice to have company while you cook and if, in addition, the atmosphere is decorated for the occasion, much better. Few ornaments are more Christmas than the tree. You can put it in the hall or in the living room, but how about putting it in the kitchen? If the stay is small you have smaller alternatives so that it does not occupy too much space. You can even create one as the example we see on the right with culinary theme. It’s very original and fun, do not you think? 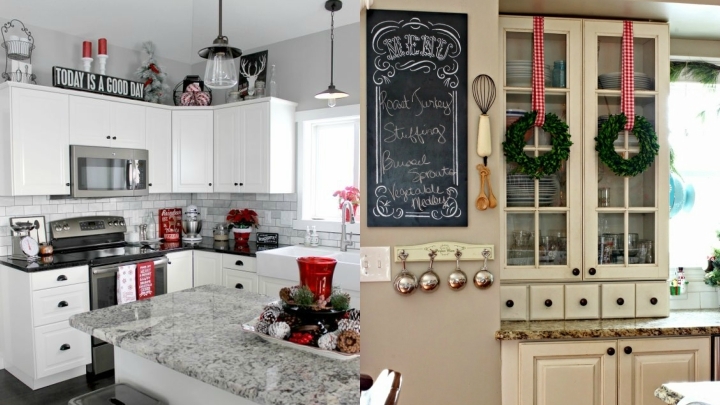 Another option is to hang a Christmas wreath on the doors of cabinets, for example. They will be very decorative and Christmas. You have several options: crowns, say, traditional, green and very natural, or perhaps something else that you can even do with your own hands. 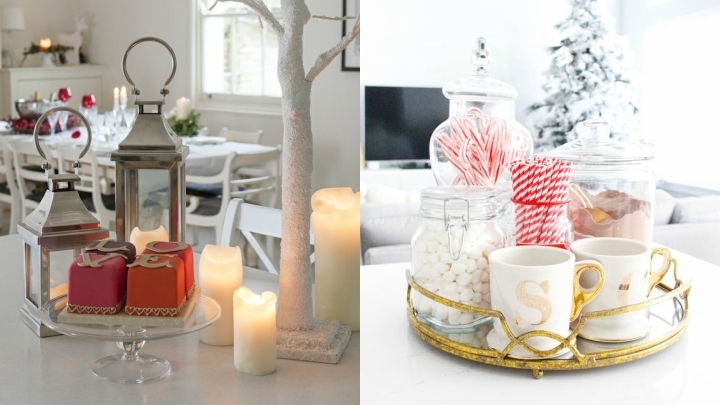 In the same way that in the hall or in the living room table for example, we put some candles and some pineapples, also in the kitchen you can introduce accessories with Christmas theme to decorate the room. You can place some red ribbons on your glass jars if you have them in view, or make a kind of decorative center also with candles or other types of accessories. If you bet on typically Christmas colors such as reds, whites, golds and greens, you will surely succeed. The garlands are also super Christmas. The fairy lights are my favorite and allow a lot of alternatives. I like to put them inside a glass jar or a candle holder. It is very decorative and cozy, and if you put them in a boat like the ones you have in the kitchen this element will be integrated perfectly into the room. 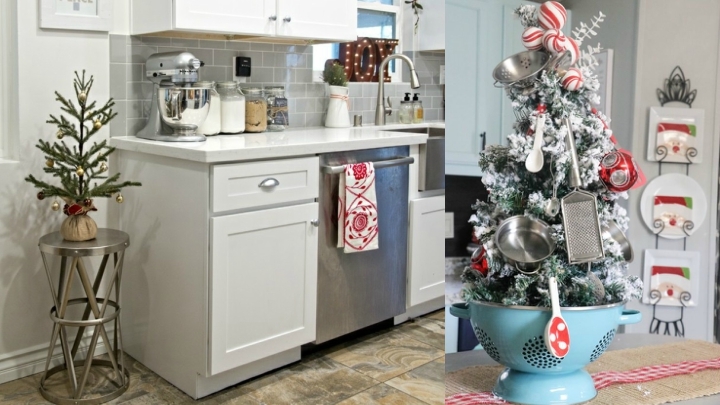 If you prefer the lifelong colors, which we put in the tinsel tree, you can also put them in the kitchen: hung in the cupboards, on the door or in the chairs, or for example. 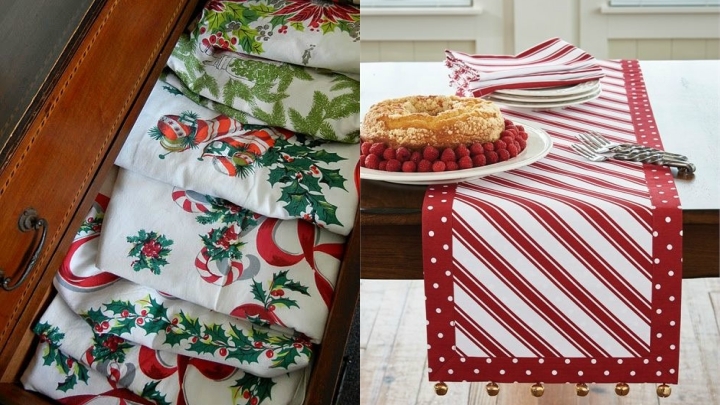 Another way to play with Christmas decoration for your kitchen is through textiles. It’s time to take out the heavy artillery: cloths of Santa Claus, snowmen, reindeer or gingerbread cookies, plain red, green or white cloths, Christmas tablecloths, napkins and even an apron that tells us at what dates we we find. The textiles will also help you decorate the kitchen for the occasion. Something similar to what we have seen before with the crowns you can do with the handles of the drawers. You can put some ball or ornaments that we hang on the tree but, in this case, they will stay in the kitchen to give it that special Christmas touch.